The highly respected Basket RR14 EVO Road Rail Access Platform is the biggest selling Road Rail MEWP (mobile elevated work platform) in the UK. This reliable rail access platform has been successfully operating since 2003 and is also now available in the current EVO-2/400 Hydrostatic Drive version. With nearly 200 road rail MEWPS successfully operating in the UK, this is officially the Number One UK road rail access platform. Our UK exclusive machine is not only easy to use, but also lighter and more compact than its competitors. As a result of this logistics costs can be cut for rail industry machine operators. However, there are no compromises on the excellent build quality. 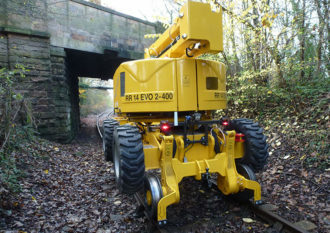 The RR14 EVO/2-400 is creatively designed and sturdily built specifically as a road rail access platform. 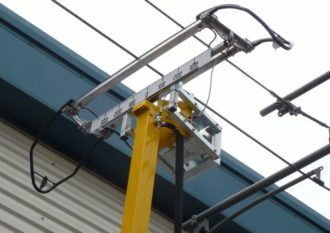 Unlike its competitors, this most reliable road rail access platform is not a conversion from a conventional MEWP. The Basket RR14 EVO road rail access platform is manufactured specifically as a rail industry machine. Furthermore, the original RR14 MEWPs have now completed their 16th year of active and successful service on the NWR infrastructure. For this reason alone the reliability and build quality of this road rail access platform is second to none. The advancement of these class leading rail industry machines is through not only excellence in innovation but also ease of use. This forward thinking and unique design has established them as a consistently reliable, efficient, and safe working road rail access platform. As a result, our machine continues to surpass the stringent standards and requirements that the modern Rail Industry demands with flying colours.